Avalon Waterways has chosen two very famous ladies, one an Australian and the other an American, to launch their new river ships. They have announced that the ever popular Sydneysider, Deborah Hutton, will christen one of their, new ships, the luxurious Avalon Illumination, which will be launched in Europe in June next year. Avalon Illumination has been specifically designed with Australian travellers in mind and features two decks of all suite accommodation with wall to wall panoramic windows. Commenting on her role as Godmother, Deborah said she was honoured to be invited to take part in such an important maritime tradition. Avalon Illumination will join twelve other Avalon ships in what is already the youngest fleet operating on the rivers of Europe. With a range of cruises on the Rhine and Danube Rivers in 2014, Avalon Illumination will offer 30 per cent more suite space than most river cruise ships, featuring wall to wall panoramic windows that transform the entire suite into an open air balcony. Room enhancements include a sophisticated European interior design, premium bedding from the Comfort Collection by Avalon, fresh flowers, contemporary marble bathrooms and luxury products by L’Occitane, which is one of my favourite brands. Other ship features will include an impressive central lobby, an elegant dining room with sweeping views, a club and main lounge, a hair salon, a gym, an internet corner and wi-fi access, as well as Avalon’s popular rooftop Sky Deck with a whirlpool and open-air bistro. Avalon first pioneered the larer suite concept in 2011 with the launch of Avalon Panorama, this concept was developed with Australian travellers in mind and has met with sell-out success. 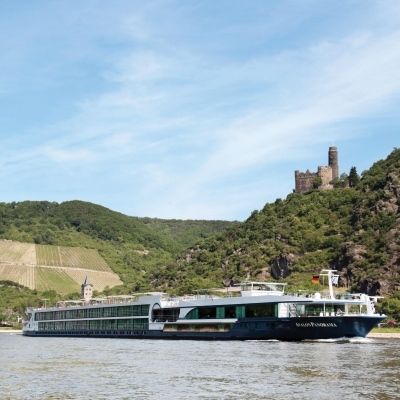 Avalon Waterways has also announced that Patricia Schultz, the New York based travel writer and author of 1,000 Places to See Before You Die, will christen its newest luxury ship, the 83 cabin Avalon Expression, at a ceremony on the Moselle at the scenic town of Cochem, Germany, on 6 May this year. Avalon Waterways operates the most modern river cruise fleet in Europe, with an average age of less than three years. In 2014 it will offer thirteen luxury ships, including eight revolutionary Suite Ships. Avalon’s river cruise itineraries on the great waterways of Europe include the Rhine, Danube, Moselle, Main, Rhône and Seine rivers. The eight day cruise, A Taste of the Danube, between Budapest and Vienna is very popular with Australians, along with the eight day Romantic Rhine between Zurich and Amsterdam plus the eleven day Burgundy & Provence cruise between the Côte d’Azur and Paris. Avalon Waterways also offers sixteen other itineraries on the Mississippi, Yangtze, Nile and Mekong rivers, as well as among the Galápagos Islands. 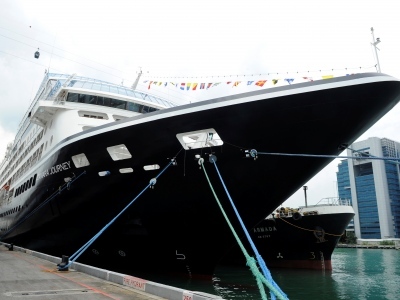 Azamara Journey has recently emerged from an eight day drydock in Singapore’s Sembawang Shipyard complete with a refresh of all public spaces and staterooms plus an elegant new “Azamara Blue” exterior hull. The second of Azamara Club Cruises’ twin boutique ships to undergo refurbishment, Azamara Journey is now ready to continue its Asia season. 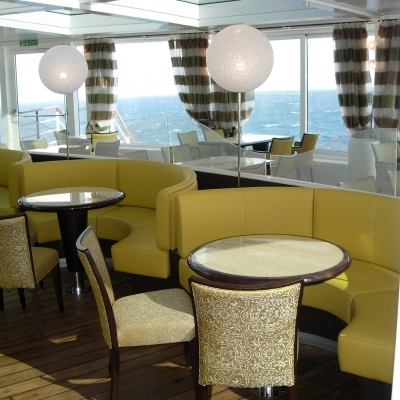 A new colour palette in public spaces reflects the cruise line’s inviting atmosphere. The refurbishment also included new carpets, upholstery and new mattresses. Veranda furniture for suites and staterooms has been upgraded which should add to guests enjoyment while relaxing on their balcony, sipping a cocktail or two and watching the ocean. The pool has been resurfaced and should prove to be a very popular area on the outer decks, with new sun lounges and new pool towels. The Spa and Fitness Centre has not been overlooked during the renovations, now having a new steam room, showers and state of the art Life Fitness cardio equipment. I am not much of a fitness fan and generally keep away from gyms when I am cruising, but this sounds so good I will have to make an exception and try this fitness centre. Aqualina, one of the ships’ two specialty dining venues, has a new caviar and champagne bar as well as a new Chef’s Table concept featuring three wine degustation menus – Italian, French and Californian. At Mosaic Café, the ships’ central gathering spot, guests can purchase a freshly brewed cup of bespoke coffee. The Casino Bar was also expanded and enhanced with new furniture. Azamara Journey, with a combination of 347 suites and staterooms, offers a European boutique hotel ambience with extraordinary service, fine cuisine and wines from around the world, plus wellness and vitality programs, all while sailing to a host of destinations larger ships cannot reach. Inclusive amenities such as complimentary bottled water, sodas, specialty coffee and teas, as well as red and white boutique wines to accompany lunch and dinner plus shuttle transportation to city centres in ports, where available, and the included gratuities for housekeeping, dining and bar staff are some of the reasons why Azamara Club Cruises stand out from the rest. The complimentary self-service laundry will be popular with Australian guests. Suite guests also enjoy the additional benefit of English Butler service. Azamara features longer stays and more overnights in port giving guests the opportunity for night touring. Paired with the new inclusive AzAmazing Evening on every voyage, starting with the Europe 2013 season, Azamara guests will experience the nightlife of some of the world’s most exciting destinations. Holland America Line, a division of Carnival Corporation, has a fleet of fifteen ships offering cruisers exciting itineraries visiting all seven continents. Highlights include Antarctica, South America, Australia/New Zealand and voyages to Asia. Some of their most popular sailings are to ports in the Caribbean, Bermuda, Alaska, Mexico, Canada/New England, Europe and Panama Canal. They even offer a Grand World Voyage. Their elegant ships, whose names all end in “dam”, offer guests many luxurious features in their ‘Signature of Excellence’ enhancements, a commitment totalling more than $500 million, that showcases the Culinary Arts Center, a state of the art onboard show kitchen where more than sixty celebrated guest chefs and culinary experts provide cooking demonstrations and classes across their fleet. The Explorations Café powered by The New York Times, Digital Workshop powered by Windows and teens-only activity areas are some of the features which make guests keep coming back to cruise again on this line. All new stateroom amenities highlighted by flat-panel TVs and plush Euro-top Mariner’s Dream Beds ensure guests’ comfort is always at the forefront. Prinsendam, a popular ship in Holland America Line’s fleet, recently completed the transformation of the Lido Terrace, located at the aft end of the ship, into an enclosed Wintergarden, along with the addition of the casual Italian restaurant Canaletto. The new area increased the dining capacity of the Lido and provides the venue for Canaletto. Named after the famous 18th century Venetian artist, the award winning Canaletto, located in the Wintergarden, which is adjacent to the Lido dining area. Open for dinner only, the restaurant serves classic Italian fare with tableside service. With the addition of the eatery on board Prinsendam, Canaletto is now on all fifteen ships in the Line’s fleet. Prinsendam also received other cosmetic enhancements during its dry-dock in Freeport, Bahamas, including new balcony decking and balcony dividers. Holland America will add to their fleet when, in Autumn 2015, they take delivery of one new ship which is currently on order from Fincantieri shipyard in Italy. You are currently browsing the SANDRATBLOG.COM blog archives for February, 2013.